The German Shepaussiedoodle came to be one day when Kris was doing some thinking and praying. The kennel goal is to raise the best family, service/therapy dog possible. So the idea came to mind of taking the two smartest doodles (the Aussiedoodle and the Shepadoodle) and breed them together. Now we have a signature line elite to our kennel and what we feel is the Einstein of the doodles. Size can be 40+ pounds and color will vary. We hope you will enjoy our specialty line as much as we have. Jazzie is our youngest blue merle German Shepaussiedoodle female. She is a beautiful young “Lady”…she is an asset to our breeding program. 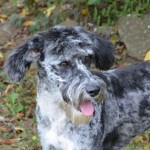 Double R Sparkle…our blue merle female…she is a hoot! Sparkle is shown in her “lion look”, with a full coat, and shaved down, she has a variety of LOOKS.